Pritchard, G.. "Stonefly". The Canadian Encyclopedia, 25 May 2018, Historica Canada. https://www.thecanadianencyclopedia.ca/en/article/stonefly. Accessed 24 April 2019. 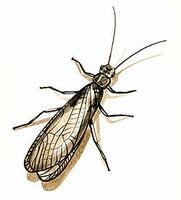 Stonefly is the common name for small to medium-sized, usually brown, aquatic insects of order Plecoptera. As members of order Plecopiera, stoneflies fold their rear wings over their bodies at rest (artwork by Jan Sovak, 1989). Stonefly is the common name for small to medium-sized, usually brown, aquatic insects of order Plecoptera [Gk "folded wings"]. About 2000 species are known worldwide, over 300 in Canada. Because the aquatic larvae normally cannot live in warm or polluted water, stoneflies are more common in mountainous areas of Canada. Eggs are deposited in cool, clean running water. The larval stage lasts 1-3 years, depending on the species. Larvae are generally elongate, with a pair of long antennae at the front of the body, and a pair of thin appendages (cerci) at the rear. Most feed on plant material; others are predators, feeding on mayfly or midge larvae. Larvae crawl out of the water before transformation to the adult stage. Although most adults have wings, they tend to walk rather than fly. Some do not feed as adults; others feed on algae and lichens and may live 3-4 weeks. Before mating, adults often communicate by drumming with the end of their abdomen.